Minonk Fire Protection District will have 2 seats available in the Spring 2003 election. You will be able to pick up petitions for the 6-year terms for Jerry Welch or from Tom Janssen Law office. Tom Barth and David "Fuzzy" Timmerman seats are up. Tom has decided not to run for re-election. Petitions can be circulated starting October 25. Please contact Jerry Welch at 432-3524 or Joe Schmillen at 432-2226 if you have questions about the District. American Legion Commander Melvin Matter said that the American Legion Auxiliary is recruiting new members. Any woman whose husband, father, grandfather, son, grandson, or brother was a member of the military is eligible for membership. Those interested should contact him at 432-2909. Matter indicated that if new members are not recruited by the end of the year that the Auxiliary will disband. The Luminary Display is once again scheduled for Saturday, December 21, 2002, with a rain date of December 22, 2002. Volunteers will be distributing the order forms November 10 to the homeowners in the City so please be looking for them. If you do not find the order form they will also be available at several businesses in town. The display is scheduled for dusk. Distribution of the orders is December 14, 2002 from 8:00 a.m. until 1:00 p.m. at 329 Oak Street, the green building next to Minonk Auto Body. If anyone is interested in participating in this event and can not find an order form or has questions please feel free to call Cathy McKay. Christie Ruestman is asking for youth volunteers to help her distribute flyers on the luminary display. She asks volunteers to meet her in front of Cunningham Candies on Main Street at 1:00 pm, Sunday November 10. It will require an hour of walking to distribute the flyers door to door. Ruestman mentioned that these volunteer hours can be added to the required community service hours that high school students are required to serve before graduating. Ruestman is also asking for volunteers to help put together the luminary kits. Those interested should meet her next to the Minonk Auto Body Shop at Oak and Fourth at 8:00 a.m., Saturday, December 14. She can be contacted at 432-3229. Cathy and Christie invite everyone to participate in this festive event as we light up the City of Minonk for the holiday season. A Veterans Day service was held at the Fieldcrest High School gymnasium on Tuesday, November 12 at 11:00 a.m. A military color guard opened the service followed by the playing of the national anthem by the Fieldcrest High School band. Then Fieldcrest student Ashlie McGrath led the audience in pledging allegiance to the flag. 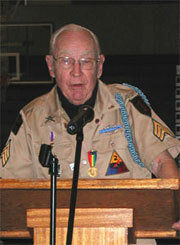 Guest speaker Dal Estes of Pontiac gave a stirring account of his experiences in World War II. The Missouri native landed on Omaha Beach on D-Day and fought in the Battle of the Bulge. Estes said that he lost many friends in the war. He said the real heroes in our country are the men who fought and gave their lives in the war, not the entertainment sports heroes who are paid millions of dollars to entertain us. Estes said he had heart bypass surgery last spring and had a stroke last month but said that he will go on talking on behalf of the veterans as long as he can. There ceremony concluded with the a 21 gun salute outside of the gymnasium followed by the playing of the taps by Wade Seggerman and Kiel Wells. "We Need A Little Christmas In Minonk" will be the theme for the Village-Aires Christmas concert. The program will be presented on Saturday, November 23 at 7 p.m. and again on Sunday, November 24 at 3 p.m. at the Fieldcrest High School Gym. Tickets may be purchased from any member or at the door. Tickets can also be purchased at Meyer-Jochums Agency. Ticket prices are $5.50 (Pre-Sale $5.00) and children $2.00. The first half of the show will explore Christmas in a small town. There is shopping to be done, visiting for the holidays, the excitement of the children, and Santa Claus. Some of the songs will be: "We Need A Little Christmas," "A Marshmallow World," and "Twas the Night Before Christmas." The women will sing "The Last Shopping Day Until Christmas." "Jingle All the Way" will be sung by the men. The kids will sing "Santa Clause Is Coming to Town." The second half of the program will give us the true meaning of Christmas. We will hear the story of Christ's birth as we listen to: "All The Stars Shone Down," "Bethlehem Procession," "Slumber, Infant Jesus", "Away in a Manger," "Good News!" and "Silent Night." Reported by Fieldcrest administrative staff. Customarily, Boards of Education review a tentative levy at least one (1) month prior to the final adoption. Final approval of the 2002 levy payable in 2003 must be completed by the last Tuesday in December. Levies may also be adopted earlier than December. A preliminary analysis of our EAV and our dollar needs in the various funds suggests that District 6 will not be able to capture more than 104.999% of the 2001 Levy payable in 2002 because of the following factors: Decrease in EAV and our tax rates in our major operating funds are currently at their maximum rate without referendum. This year's levy will not require a Truth in Taxation Notice or hearing. Nevertheless, it is recommended that because of increasing liability costs and IMRF, these two funds will be levied up. There is no limit on IMRF, Social Security and Tort. However, if we levied more than we needed it is unlikely we would receive those moneys because of the above reasons. The 104.999% of the 2001 levy generates approximately $224,296 more than last year's extension. At the December meeting the actual tax rates and extensions for each fund will be listed and final adoption of the 2002 levy will be approved. Update on East Elevator Project and other District Building Concerns: Chuck Volker said that the project is on time. Principal, Jon Kilgore is also impressed with the minimal interruptions to the school routine. Also, dust and noise pollution are minimal. We are now waiting for the block layers. Also, the gas burner for the boiler at East has been installed. The boiler and hot water tank were inspected recently. The boiler passed inspection, but the hot water tanks did not pass and need major work. The recommendation is to bypass the disabled hot water tank and install two (2) commercial type gas heaters. I will have an estimate at the December meeting. This can be a life safety project. As we talked about last month, our man lift (Genie) has been red tagged. Chuck and I attended a demonstration at East this week and were impressed with the potential replacement. We would get a trade-in on the old lift, which is twenty years old. We could also lease for two years. There are still some concerns with the heating system at South. Vendors have not been in to train personnel on operations. Russ Middleton and I are working on this. We are also holding moneys back until everything is corrected. Report on Parent - Teacher Conferences: Parent-Teacher conferences were very well attended at the K-8 level this year. Once again, teachers reported that the parents of children who are not achieving as well as can be expected, tend to not schedule regular conferences with their child's teacher. Also, the lowest conference rate is high school, as expected with the lower elementary grades having the highest parent representation. Review of School District Tax Rates for Area Districts: At the Board meeting I will present a rather comprehensive listing of area school district total tax rates. Dual districts (Elementary + High School districts) will be noted by combining the tax rates from the separate districts into one tax rate. Dual districts make up a portion of Illinois public school districts (unit, elementary and high school). The figures are for the 2001-2002 school year and are the latest available. Many school districts will be placing referenda on the ballots for April or have already done so for their various funds. Comparison of tax rates is not exact since EAV and operating costs are different for each school district. It is best to compare unit districts to unit districts of similar EAV. Obviously, this is not an exact science and costs are a function size, demographics, salaries and so on. However, Fieldcrest District 6 still has one of the lowest overall tax rates in a five county area. Review of School District 6 Year to Date Finances: I have been working closely with Carol Stenzel to get our accounts payable software to generate a user-friendly month to date and year to date finance report. In the past, year to date was easily provided under the former accounting system (Tremont). We are now using SDS, which is not similar. Nevertheless, I will present year to date balances vs. budget in each of the major operating funds. As of October 31, 2002 the District has expended approximately 39% of its budgeted funds. We have also received about 70% of our revenues from state, local and federal sources. Review of November 13th SIP Agenda Elementary South hosted a K-12 Writing consultant, Dr. Dave Tucker of Illinois State University. This choice is consistent with one of our curricular goals for this school year. He informed teachers of the State's writing expectations/standards (new). Secondly, he reviewed our ISAT District writing results and suggest ways to improve students' writing. Grade level teachers will have time to revise the District's Writing Curriculum to align with the State's expectations/standards. Fieldcrest High School will continue mapping their curriculum (Standards Articulation & Alignment) with Dr. Candace Clark. West Middle School K-8 (all other areas will continue alignment and articulation. Last, District Reading Discovery/Recovery/Title I teachers traveled to Springfield to District 186 to learn about development of a school-wide system for reading interventions and the charting method they use. Continuing Discussion on Proposed Education Fund Referendum: January 27, 2003 is the last date that a Board of Education can adopt a resolution authorizing the submission of a public question for the April 1, 2003 Consolidated Election. At the December meeting the Board will finalize a needed tax rate increase which will enable District 6 to maintain the current level of programs and services. Nevertheless, the administration and Board of Education will continue to study cost saving measures. Once the details of the financial need of Fieldcrest are determined, committees of citizens, teachers, administrator and Board members will begin to educate the public on the District's very real financial plight. Appointments: Appointed Sonja Ruestman as High School Special Education Aide, Julie Schmitt as AM ECE route driver, Gloria Milashoski and Lisa Musser as Middle East Cheerleader co Sponsors. The Fieldcrest Lady Knights defeated Henry Thursday night 48-28 in a game at Minonk. Fieldcrest was led by Jamie Arndt with 15 points while Sara Fluech garnered 11 rebounds. Fieldcrest was defeated by Dwight 56-48 Friday night in the title game of the Dwight Turkey Tournament. Fieldcrest was led by Eric Heider with 18 points and Shaun Manning with 17 points. The Knights defeated Beecher, 52-35, in a semi-final game Wednesday in the tournament. Shaun Manning and Eric Heider led Fieldcrest with 14 points each while Jamie Bliss added 9 points. Fieldcrest lost its season opener in the tournament to Iroquois West. The Knights scoring leaders were Josh Baker and Geoff Reiter with 14 points each. The Westside Park pavilion committee met Tuesday afternoon at City Hall to discuss what action to take after reviewing the bids submitted for construction of the pavilion. Bids for construction of the Westside Park pavilion were opened November 19 at City Hall. The low bid received was from Tjaden Construction of Minonk at $102,000. The bid amount is over the estimated $80,000 set by the Westside Park pavilion committee. Some at the meeting felt that the committee should run the project itself in order to complete the construction with the funds that are available. This would involve getting volunteers to donate their services. The feedback received from some of the contractors indicated that the materials specified in the blueprints were very expensive which may account for some of the high bid amounts. The committee has asked architect Chuck Fischer to discuss the building specs with low bidder Tjaden Construction next week in order to determine if it is possible to change the specs enough to lower the bid price within the range of the project's budget. The committee will meet on December 11 with architect Fischer to discuss the results of his meeting with Tjaden. At that time the committee will be advised as to whether the bid specs can be changed enough to lower the bid amount. In addition, the committee will determine if the changes are acceptable. If not, the remaining options will be to try to solicit more funds, have the committee become the contractor, or redo the building specs and resubmit the specs for bidding.